The results of the survey prove that 71.9 per cent of the companies experience a strong technology change. The implementation of new technologies is mostly driven by internal company innovations and has impacted strongly on production infrastructure and supplier network. Companies that experience a significant technology change also expect greater dynamics in their regional distribution within the next five years. Established specialist magazines and leading media have proclaimed technology change for a long time. Driving assistance systems, electrical drivers, lightweight materials and the Internet of Things have, among many other developments, radically changed the manner in which we use products. This trend is expected to be the catalyst for drastic changes within the companies. Eventually, these developments will permanently change entire industry sectors. By examining this volatile topic, GEXSO aims to disclose its impact on automotive suppliers, machinery and plant engineers and industry component manufacturers in particular. Global technological trends are the focal point of the analysis, which evaluates their relevance for industry sectors and new product and process technologies. Furthermore, we discuss how new technologies are detected and implemented within the companies. GEXSO evaluates how exactly the new technologies change existing supply chains as well as discussing the already established implementation skills found in companies. Based on the companies’ perception of the changes that result from new technologies, GEXSO assesses how relevant technology change is for the examined industry sectors. The more technology change is noticed within an industry sector, the more relevant it is. GEXSO fits all answers into six categories. While the options “fully applicable”, “largely applicable” and “partially applicable” confirm the relevance of technology change, the options “partially not applicable”, “largely not applicable” and “not applicably” do not. 71.9 per cent of the companies of all industry sectors agree that they are experiencing a strong technology change that has lasting effects on their business. Almost a third of these companies have revenue of over one billion euro. This unequivocal affirmation confirms the strong relevance of new technologies for all examined industry sectors, regardless of company size. While 75.4 per cent of the companies see themselves capable of efficiently and quickly implementing new technologies, 24.6 per cent attest their company to having insufficient implementation competencies. 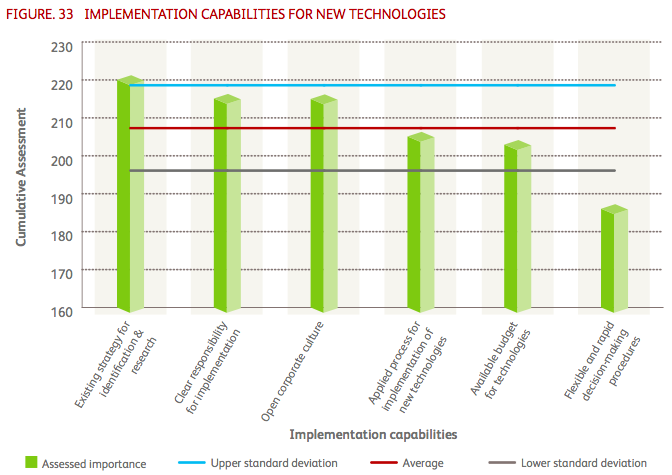 Implementation competencies are a crucial factor for successfully optimizing potential through new technologies. They also enable the companies to remain technologically competitive in fast emerging markets. GEXSO examines the prerequisites that companies create for effective and quick usage of new technologies. The companies’ competencies were evaluated on a scale, on which the individual results were cumulated in order to achieve a conclusive overall result. 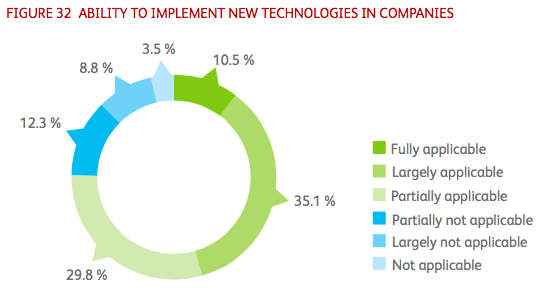 Companies most likely have an existing strategy for the identification and development of new technologies. This is important in order to boost innovation and for the early identification of market trends. Companies that identify and use new technologies at an early stage are able to secure competitive advantages. Furthermore, participating companies have clear responsibilities for implementation processes and have established an open corporate culture that promotes innovation and change processes. While responsibilities are quickly defined, it may take years to sustainably change a corporate culture. However, this is a crucial factor for the implementation of new technologies. Contrary to the cross-industry average, the open culture within the industry component manufacturing sector is increasingly seen as a deficit that hinders the implementation of new technologies. 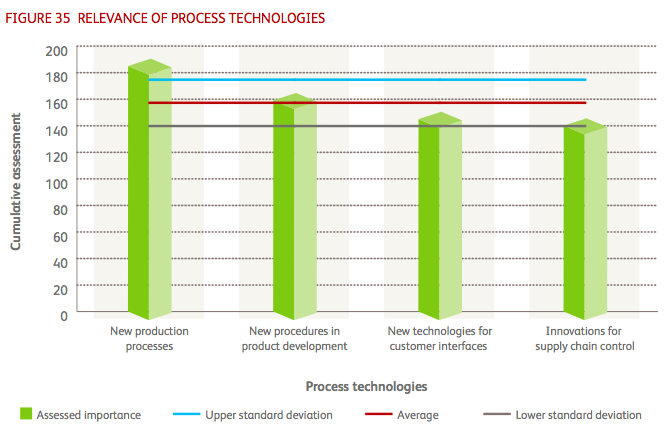 Most companies do not have sufficiently defined and implemented standard processes for the implementation of technology change. This implementation is often associated with large investments. However, the results of the study confirm that in most cases there is no sufficient budget. Solely the machine and plant engineering sector is not as affected by this restriction. According to the results of the survey, this industry sector often provides outstandingly sufficient budget allocation for innovation. The biggest challenges companies face are inflexible and lengthy decision-making processes. These can cause delays in the identification and implementation of technological developments and lead to a loss of competitive advantage. Therefore, there is potential for optimization in the simplification of decision-making processes in all three industry sectors. In order to precisely characterize technology change, GEXSO also discussed relevant product and process trends in all three industry sectors. Within the field of product technologies, the interviewed experts currently regard the use of new materials as the focal point for innovations. The use of new electronic components for finished products also plays a major role while the use of new mechanical components is only partially important. Chemical components, new methods to optimize energy supplies, an adjustment of the overall system architecture and software solutions only play a marginal role. There are distinct differences in relation to the importance of technologies for the individual industry sectors. While the automotive supplier industry focuses on new materials and new mechanical constructions, adjustments of electronic components and new software solutions are most important for the machinery and plant engineering sector. The industry component manufacturers are confronted with a variety of new technologies. They simultaneously promote innovations for new materials, electronic components and methods to optimize energy supplies. Innovations do not only affect product technologies but they also continuously change corporate processes. Across all sectors, production procedures are affected the most. 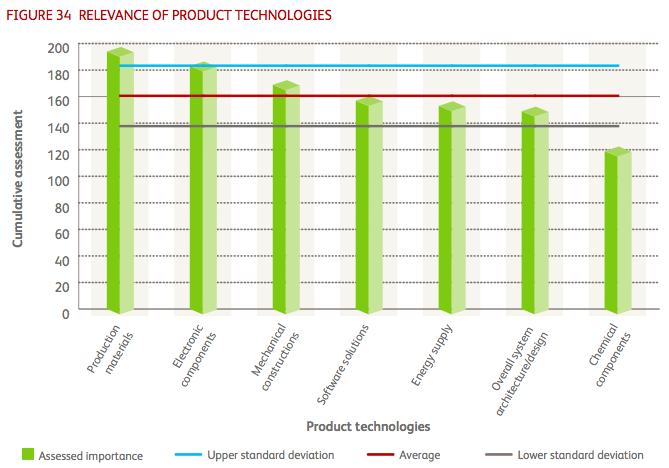 New methods for product development only play an average role for technological innovations. In particular, companies within the machinery and plant engineering sector do not expect any major developments in this field within the next few years. Contrary to expectations, innovations for the management of supply chains and interface technologies for customers will be less affected by technological progresses in the markets. Overall, the results of the study depict that there is a strong focus of new product and process technologies on key aspects of the supply chain, and on production and materials in particular. GEXSO examines the company’s internal and external technology drivers that create innovation, thus releasing potential for optimization for businesses. The results demonstrate that the most important sources for new technologies are located within the companies themselves. As expected, most companies increasingly rely on their own development competencies for the research of technical innovations. Frequently, customers also demand new technologies, thus urging the companies to implement these. 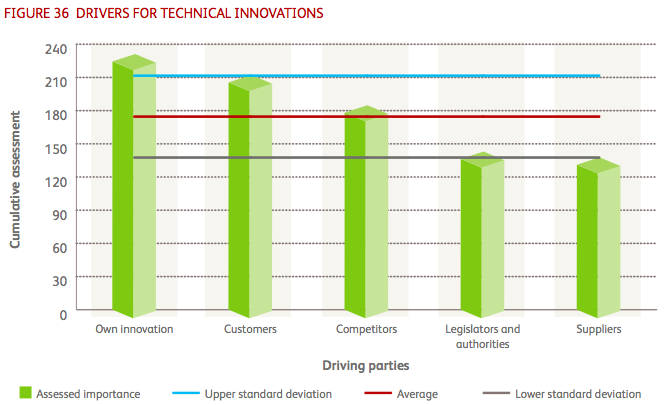 Competitors have an average impact on newly applied technology within the companies. If the implementation is driven by an external factor such as a customer or a competitor, reactive behavior can cause need for action and a loss of potential for optimization. Suppliers, legislators and public authorities rarely function as drivers for the introduction of new technologies. The results of the study demonstrate that companies increasingly generate innovations within their own businesses. Furthermore, only they are able to implement these innovations. Therefore, companies increasingly need to accept individual responsibility in times of technology change. GEXSO analyzes which business areas are involved in the accomplishment of this trend. As expected, the department for research and development plays the most important role in this process. The executive management is closely integrated into the implementation of new technologies. It is the focal point for corporate management and generally responsible for the selection of new technologies. Marketing/product management, sales and production are relatively involved in the implementation of trends. Therefore, production holds a special status among other supply chain functions such as procurement and logistics, which only have a very small impact on new technologies. This can be explained through the focus of new technologies on production components and the restructuring of established production procedures. IT functions within the companies also have little impact on technological progress. This is interesting, since many IT departments actually have a major impact on the organization of process-oriented technology change. It is striking that technology change is increasingly managed centrally within the companies, while important supply chain key functions are only marginally involved. 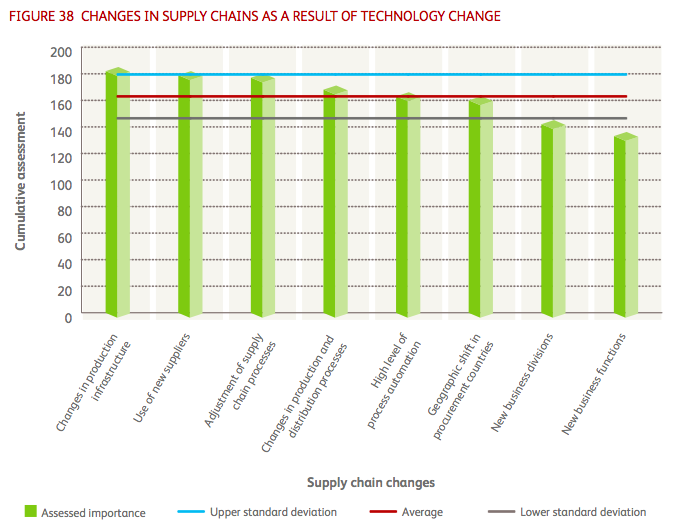 The results of the study demonstrate a variety of issues in which technology change impacts on supply chains. Particularly the production infrastructure and supplier networks are affected by technology change. Many participants of the study also mentioned the adjustment of supply chain processes as a significant consequence of the implementation of new technologies. Production and distribution processes of the companies, the automation of processes and the selection of countries for procurement are only moderately affected by technological innovations. 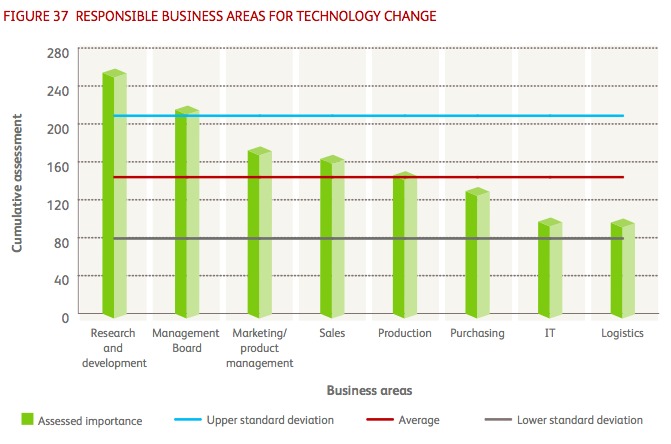 Few companies expect new business and functional areas in relation to technology change. The results of the study illustrate that technological focus tends to lie more on operative corporate structures and supply chain processes. The interviewed companies rarely consider a strategic reorientation. Companies that experience particularly strong technology change generally globalize their supply chain more actively. There is a correlation between the awareness of technology change and the measured dynamics of globalization activities according to production sites. 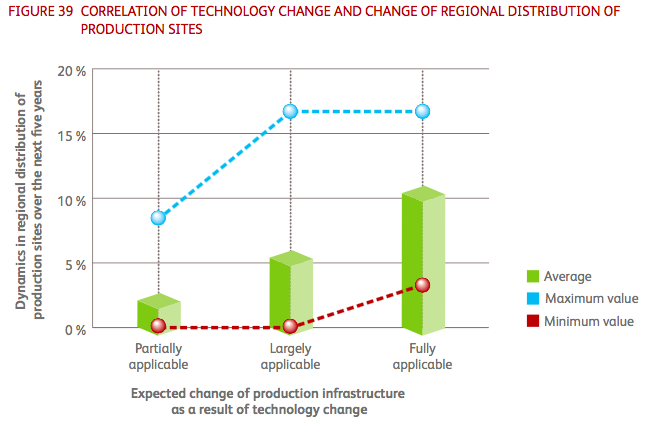 Dynamics is defined as a proportion of the regionally changed production capacities in the next five years. The correlation coefficient is 0.54. 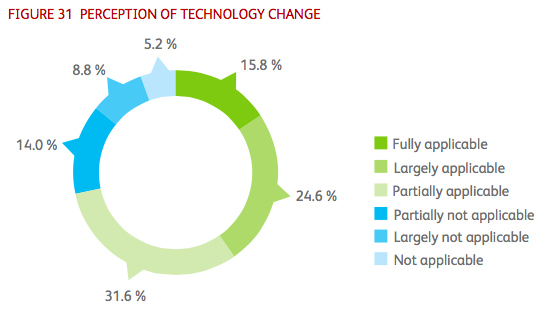 According to the results of the study, technology change promotes and is a catalyst for globalization activities.